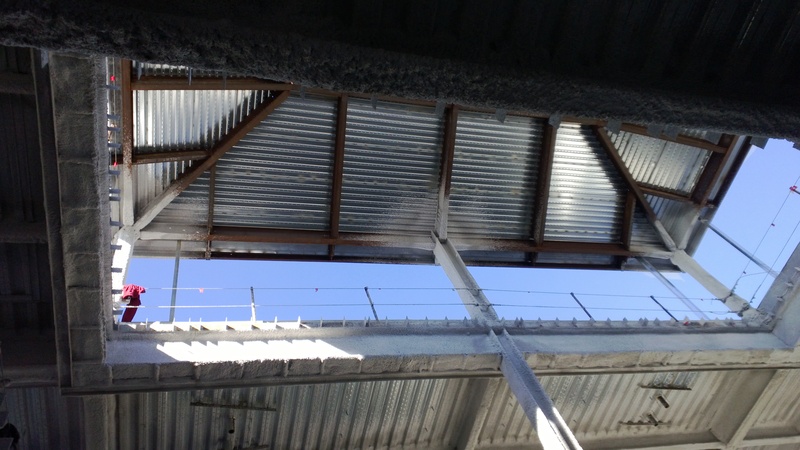 If you’ve been past Aztec Student Union lately, you may have marveled at some of the shiny roof beams that have arisen. Earlier in the month, an equipment operator completes a supply delivery to an upper floor of the project. 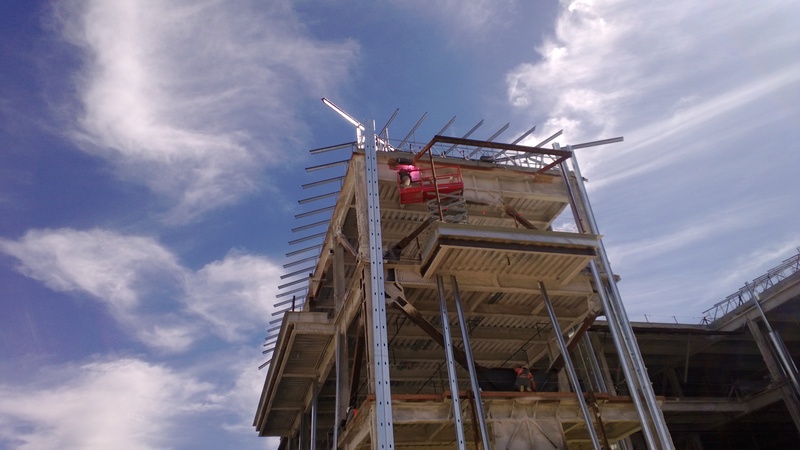 Across the project’s rooftop, metal beams stick out like ribs or bring to mind memories of childhood Erector sets. They interrupt the stark blue of the sky and catch the light easily. A project member stands atop a scissor lift and welds in what will eventually be part of Associated Students’ office space. The beams serve a mostly ornamental purpose, and will hold aloft tiled roofs similar to those seen on Hepner Hall and Hardy Tower. 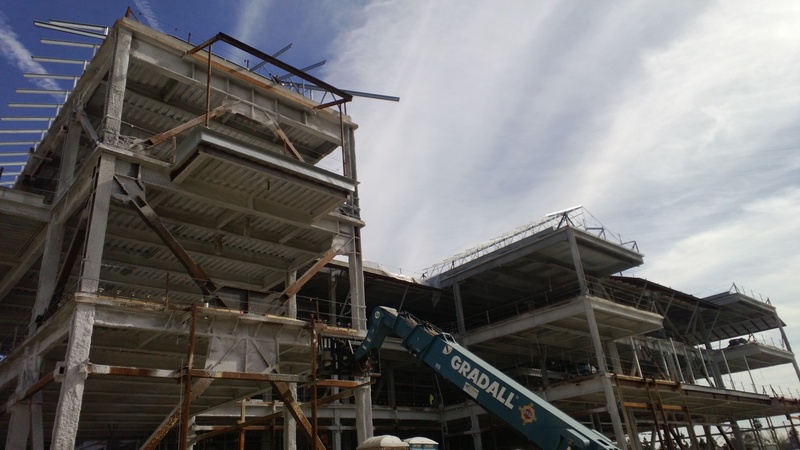 Here, you can see how a lifted roof will eventually allow for natural daylight to filter into the office below. Of course, there is a “real” roof underneath all those beams, like the one pictured above and below that will eventually allow natural daylight to filter into the offices below. 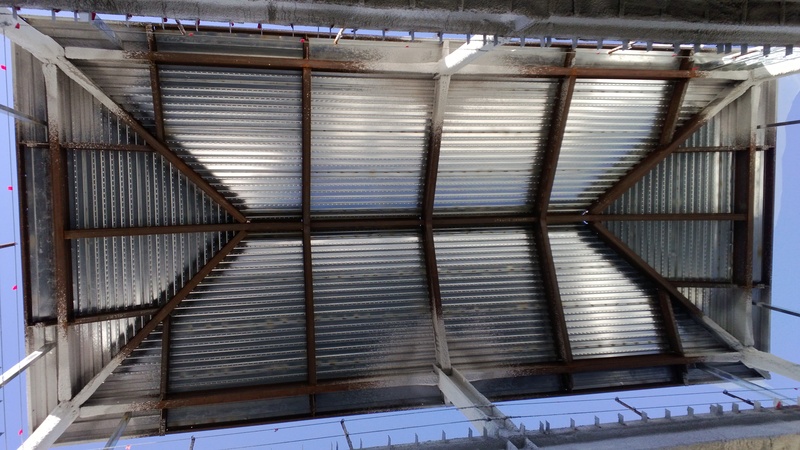 The metal roof is visible from the second floor of Aztec Student Union, near offices for student organizations. To watch the roofing in action, be sure to watch the live construction camera on the Aztec Student Union website. Need more Aztec Student Union? Be sure to “like” the project on Facebook or follow it on Twitter.